Building on last year's successful showing of art in the Village at Cold Springs model home, Hayden Homes is now sponsoring a contest for high school juniors and seniors this spring. Sisters High School (SHS) art instructor Bethany Gunnerson will soon be collecting artwork proposals from her junior and senior students who will be participating in the competition that will land the winner a $2,500 art scholarship from Hayden Homes, awarded upon graduation. To participate, students will first design a 2D sketch of an all-original art work. The Sisters Arts Association judges will review the designs and select a winning concept. Hayden Homes will commission the piece, which will then be displayed in a Sisters community model home beginning in summer 2019. "It is Hayden Homes' honor to partner with Sisters High School and the Sisters Arts Association to showcase the incredible talent of Sisters Country youth," said Geoff Harris, regional director for Hayden Homes. "We are excited to showcase a unique piece of local artwork in our model home." Katy Wooderson, marketing director for Hayden Homes, said, "We have supported both the high school arts program and the Sisters Arts Association in the past and were excited to collaborate with both to acknowledge and honor the incredible talent of Sisters Country youth." "We are committed to supporting the communities in which we build. We know arts make the Sisters community strong. The arts are an essential building block in the schools and are of great value to the Sisters community." Students have until March 15 to draft their proposal, which will include a sketch of the piece along with a description of the artwork, execution strategy and supply needs. A team of judges from the Sisters Arts Association will complete their review of the artwork. Bob Burgess, board president of SAA, noted, "Hayden Homes is very conscious of the arts and of what we do, and initially got a hold of us over two years ago and asked how they can help support the arts in Sisters community." This competition is very much like real-life design projects in which artists and designers must create proposals and need to win the bid to get the work. 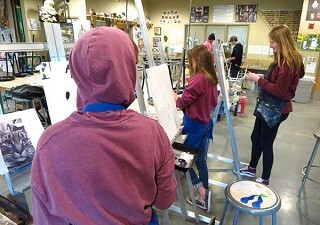 "The students are so extremely fortunate in Sisters to be supported by special programs that enable them to express their own art," said Gunnarson, "The Hayden Homes contest ups the ante and will encourage new focus and intensity in our arts students as they hone in on their unique creative style. "I'm grateful to Hayden Homes for bringing this new opportunity to our students, and not just to seniors but to juniors as well. I liked that they met with me and I was able to give my opinion on students' needs and what would make most sense. This scholarship should let students apply the funds to not only tuition, but materials associated with schooling, like books and art supplies. "I really like that Sisters Arts Association is involved in choosing the winning design which ties in our local community of artists in a way that we've been hoping for." There has been plenty of positive response since Gunnerson sent the Hayden Homes proposal to the junior and senior art students. She added, "This competition will be done entirely on their own and not part of school projects most likely, so it is an unknown to everyone how many proposals we might receive." The winning concept will be announced the week of March 18. The art piece will then be commissioned by Hayden Homes for completion by May 10. The student artist will share their work at a special "Meet the Artist" night at the model home to kick off a season of display alongside a framed photo and bio.